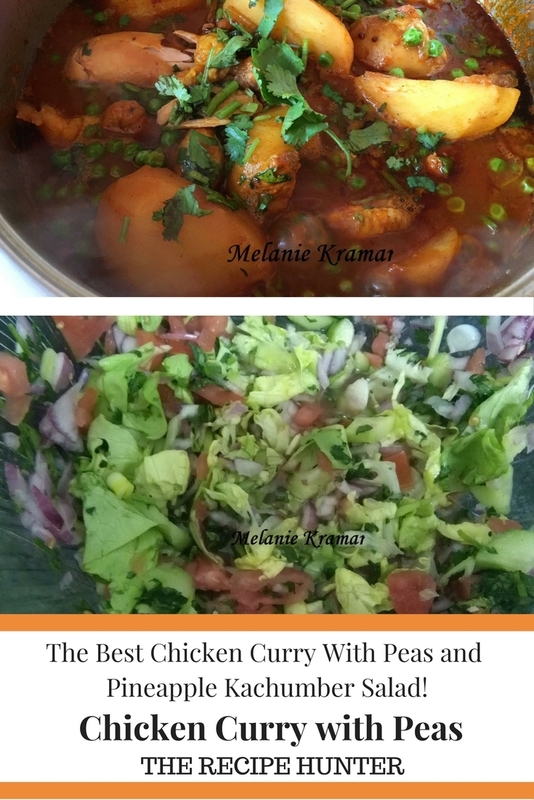 The Best Chicken Curry With Peas and Pineapple Kachumber Salad! Dry roast all seeds and grind in the coffee grinder till course but not a fine powder. Heat oil and add onion and chilies and fry until onion tender. Add ground spices and fry a few minutes. Add chicken and fry until chicken changes color and no longer pink. Except 1 tsp jeera powder and garam masala. Toss until meat well coated. Fry on a low heat uncovered until it starts catching. Add a splash of boiling water from the kettle. Add tomatoes, curry leaves and salt and simmer on medium/low for 10-15 minutes, until chicken is tender and gravy thickened. Then add potatoes and about ½ cup of hot water or more and allow to cook on medium to low heat until potatoes are soft. Add the frozen peas, 1 tsp jeera powder, garam masala and chopped coriander and simmer another 10-15 minutes. Finely chop the onion, tomato, cucumber, pineapple, lettuce, coriander leaves and green chili. Add enough vinegar to coat well. Mix again and adjust seasoning if necessary. Mix all the ingredients well and serve chilled.